The Congressional Budget Office (CBO) has released its 2015 to 2025 Budget and Economic Outlook. In this yearly publication, the CBO examines current laws (taxes and spending) and projects the outlook for the federal government’s budget for the next 10 years. 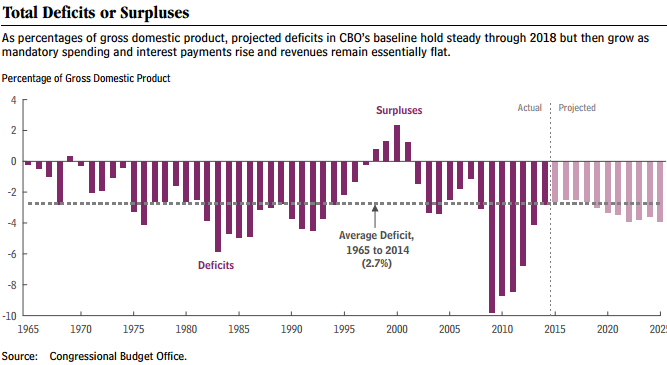 One of the topline projections the CBO makes is the budget deficit. This measures the difference between federal government spending and federal tax revenues (a higher deficit means the federal government is spending more than receives in tax revenue). The budget deficit has been in peoples’ minds for the past few years. The recession drove revenues down and lawmakers pushed through expensive stimulus spending bills, which combined to create massive budget deficits (the budget deficit was about $1.3 trillion in 2010). People were concerned about this, so many have been paying attention to the deficit’s year-to-year movements. In recent years, as the recession has ended and as stimulus spending has wound down, the budget deficit has shrunk from its high. 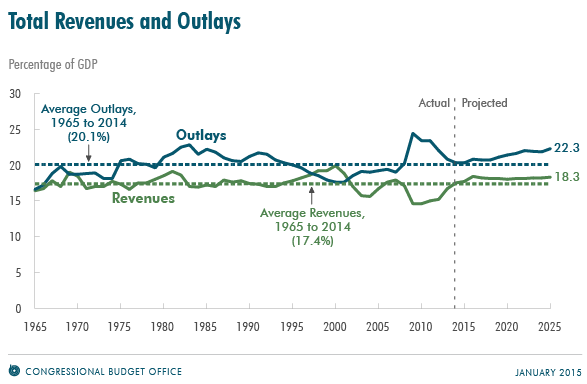 CBO’s latest numbers show that in the next two fiscal years (2015 and 2016), tax revenue growth will keep pace with spending growth. This means that the budget deficit will shrink slightly in fiscal year 2015 to 2.6 percent of GDP from 2.8 percent of GDP in fiscal year 2014. Between 2016 and 2018, it will remain about flat. A reasonably positive outlooks in the near term. However, after the next couple years, the deficit will begin to climb again. From 2019 to 2025, the deficit will increase each year, except in 2023 and 2024 when it shrinks slightly. By 2025, the government will be back to $1 trillion budget deficits or a deficit of 4 percent of GDP. Certainly not the highest it has been the last couple of years, but it is “well above the average of 2.7 percent of GDP over the past 50 years,” according to the CBO. The CBO also shows that the growing budget deficit is mainly driven by increased federal spending, rather than a shortage of tax revenues. From 2016 to 2025, tax revenues will remain around 18 percent of GDP. Meanwhile, spending will continue to increase as a share of GDP from a little under 21 percent of GDP in 2016 to 22.3 percent of GDP in 2025. 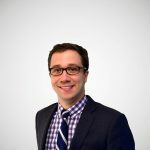 Over short periods of time, fluctuations in budget deficits aren’t all that meaningful and can be driven by cyclical movements in the economy. It is also hard to predict exactly what will happen in the future. However, the long-term trend towards larger year-to-year budget deficits projected by the CBO are slightly more alarming. Higher deficits means that the government will be tacking on more debt and could have trouble meeting its obligations in the future.